Just over a year ago, the United Nations agreed to an ambitious agenda for bettering the lives of people around the world – the Sustainable Development Goals (SDGs). The SDGs call for countries to improve across 17 issue areas, including economic growth, accountable institutions and reduced inequality, among others. While the target for achieving the SDG goals is not until the year 2030, the publics in three major African nations are increasingly concerned about some key development issues. At the same time, they express considerable optimism about the future. 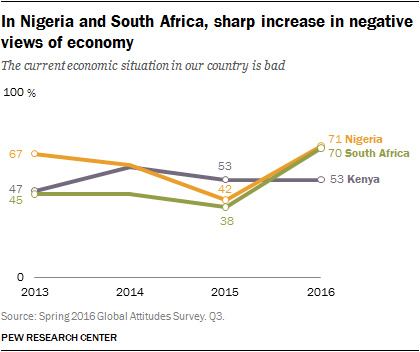 In South Africa and Nigeria – sub-Saharan Africa’s two largest economies – economic sentiments have turned sharply negative since 2015. Around seven-in-ten South Africans and Nigerians now say their economies are in bad shape. Meanwhile, in the East African economic hub of Kenya, just over half say the same. Large majorities in all three countries consider the lack of employment opportunities a very big problem. Moreover, as a new Pew Research Center survey of these three major African nations illustrates, many believe the political and economic system is stacked against them. Political corruption – seen by many experts as a key stumbling block to a country’s development – is a major public concern. Broad majorities in all three countries name government corruption as a very big problem. Most South Africans, Kenyans and Nigerians believe that government is run for the benefit of only a few groups of people in society. And, perhaps most troublingly, only around a third of South Africans and Kenyans say government corruption will be better in their countries when today’s children grow up. Nigerians are more optimistic that there will be less corruption in the future – 60% expect things to improve. In the economic realm, most see rewards and opportunities going primarily to those at the top. Majorities in all three nations say the gap between rich and poor has increased over the past five years. And when asked why so many people lack jobs in their country, the top reason given is that many jobs go only to people with connections. Despite these concerns, there is considerable optimism about the future across the three nations surveyed. At least six-in-ten in each country say health care and education – two key issue areas that are highlighted by the SDGs – will be better for the next generation. And even though their views about the current state of the economy are negative, most are upbeat about the short-term economic future: Majorities in Nigeria, South Africa and Kenya believe their countries’ economies will improve in the next 12 months. Moreover, roughly three-in-four Nigerians, Kenyans and South Africans believe that young people today who want to live a good life should stay in their countries rather than move abroad. These are among the key findings of a new Pew Research Center survey, conducted in South Africa, Nigeria and Kenya among 3,330 respondents from March 29 to July 9, 2016. Pew Research Center is a subsidiary of The Pew Charitable Trusts, its primary funder. This report was made possible by The Pew Charitable Trusts, which received support for the survey from the Bill & Melinda Gates Foundation. The Sustainable Development Goals are wide-ranging, covering topics such as poverty, clean water and sanitation, and climate change. Among publics, however, there are clear priorities as to what they believe are most important for development. When South Africans, Nigerians and Kenyans are asked about the best example of an economically developed country, they tend to cite the U.S. and China. In Kenya, 36% say the U.S. is the best example, while 15% feel this way about China. South Africans are split between the two countries (27% U.S. vs. 22% China), as are Nigerians (25% vs. 28%). When asked what makes the U.S. or China the leading model for development, many respondents note the economic opportunities and growth in the two nations. Beyond this, however, people provide very different rationales for what makes the U.S. or China the best example. Respondents who name the U.S. tend to focus on American governance, citing good leadership and low levels of corruption, as well as education as reasons why the U.S. is economically successful. People who think China is the best example of an economically developed nation attribute this to Chinese technology, as well as their manufacturing and exports and their work ethic. South Africa, Nigeria and Kenya are complex societies, each with its own deep, long-standing cleavages that often divide public opinion. In South Africa, there are significant differences among the nation’s white, black, and mixed-race (known there as “coloured”) communities. On a number of questions in this survey, South African blacks are more optimistic than others about the future of the country. Roughly seven-in-ten blacks (69%) think the national economy will improve in the next 12 months, compared with 46% of white and 30% of mixed-race respondents, and they are also more likely to believe their own personal finances will improve in the coming year. South African blacks are more optimistic that the next generation will see improvements to such challenges as education, poverty, health care and corruption. And they are more likely than white or mixed-race South Africans to believe that young people should stay in South Africa to pursue a good life, rather than leave for another country. And while majorities of all three groups say the government is run for the benefit of only a few groups in society, whites and mixed-race respondents are more inclined than blacks to think so. Nigerian public opinion frequently divides along religious lines, with notable differences between Muslims and Christians. In our current poll, Muslims are much more upbeat about the economy, and more likely to believe that the national economy will improve in the next 12 months. Although majorities of both groups see inequality as a very big problem, Christians are especially likely to hold this view. And opinions about the fairness of government have shifted over the past year, perhaps reflecting a transition of power from former President Goodluck Jonathan, a Christian, to current President Muhammadu Buhari, a Muslim. Among Nigeria’s Christians, 65% now say government is run for the benefit of a few groups, up slightly from 58% in 2015. Meanwhile, the share of Muslims expressing this view has dropped from 64% to 45%. Ethnic divisions are prominent on many issues in Kenya, with the Kikuyu and Kalenjin people expressing a much more positive outlook about the nation than the Luhya and Luo. Kikuyu and Kalenjin respondents are more satisfied with current economic conditions, and much less likely to say that the government is run for the benefit of only a few groups (current President Uhuru Kenyatta is Kikuyu, and all presidents since the country’s independence have been either Kikuyu or Kalenjin). Despite widespread concerns about political corruption, majorities in each of the three nations say that ordinary citizens can influence their government if they make the effort. And while concerns about government fairness divide these publics along racial, ethnic or religious lines, majorities of all groups believe their actions can make a difference. Education in South Africa. 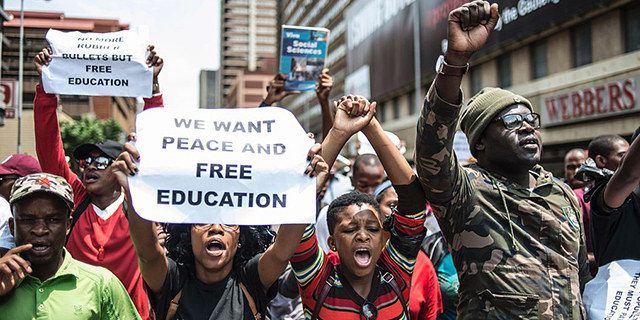 Following a year that has included a number of high-profile university-based protests of tuition fees, education is clearly a major issue for the South African public. The percentage naming poor-quality schools as a very big problem has increased 13 percentage points since 2015. And today, a 36% plurality names it as the nation’s top priority. However, there is considerable optimism that over the long term the country will make progress on this issue – two-thirds of South Africans believe education will be better for the next generation. Food shortages and energy in Nigeria. When Nigerians are asked about the top priorities for their country, the food supply and energy shortages are at the top of the list. Over the past year, there have been food shortages in northern Nigeria and fuel shortages across the country, and concerns about both of these issues have risen since our 2015 poll. Corruption in Kenya. Concern about government corruption is especially widespread in Kenya. The public is also the most likely to see a connection between governance and economic success. At least twice as many Kenyans as Nigerians or South Africans say good leadership and low levels of corruption help explain why a country is economically developed.